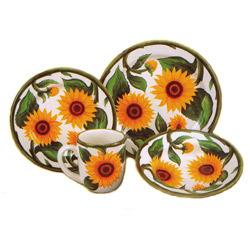 For the kitchen or for the dining room, you may prefer shopping for decorative dinnerware. 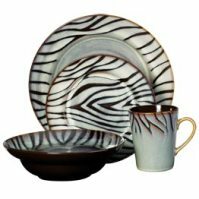 For everyday dinnerware, I usually end up picking casual sets that match the décor of my kitchen. My first kitchen was darned with strawberries, followed by apples. I even had my kitchen decorated with the fun-loving Pillsbury Doughboy. It was very cute, but I had some problems matching dinnerware, so I went with a clear glass dinnerware set. Currently my kitchen features coffee décor and the Pfaltzgraff Cappuccino pattern complements it perfectly. I love matching dinnerware with my kitchen décor. I usually start out with the dinnerware and match towels, curtains, canisters, and so forth to bring the theme alive. Theme-based dinnerware definitely cheers up the place. Because I'm prone to redecorating my kitchen, I'm hesitant about adding color to the kitchen itself. I try to stick with white or off-white appliances and neutral flooring and counter tops because it makes changing the look and feel of the kitchen a lot easier. If there were not so many choices when it comes to dinnerware, I would probably save tons of money. I tend to change my dinnerware sets frequently and redecorating the kitchen is great way of relieving stress for me. It brings a little bit of excitement to the home front. 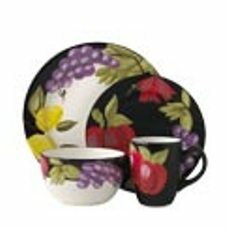 When you use dinnerware to decorate your kitchen or dining room, you can often sell the dishes and decor together for a pretty decent price. You can invest that money into new or used dishes and decor which is a budget-friendly way to redecorating. Changing home décor is always nice. It brings a new look to your home as well as making guests feel welcome. I spend a lot of time in the kitchen, and changing it up from time to time is very refreshing.